Comprehensive Dual Channel capability with dual aspect display. AUTO set up mode for instant use. 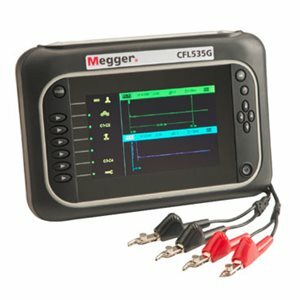 The Megger® CFL535G is a state of the art, dual channel, high resolution, compact Time Domain Reflectometer with a color screen for locating faults on paired metallic cables. The CFL535G has a minimum resolution of 0.3 ft /0.1 m and a 60 kft/20 km maximum range depending on the velocity factor selected and the cable type.